Please join us for the 5th annual Dyslexia Dash of East Alabama on March 2, 2019! For the past 5 years, the Dyslexia Dash of East Alabama has raised funds to support students with dyslexia and other reading difficulties. 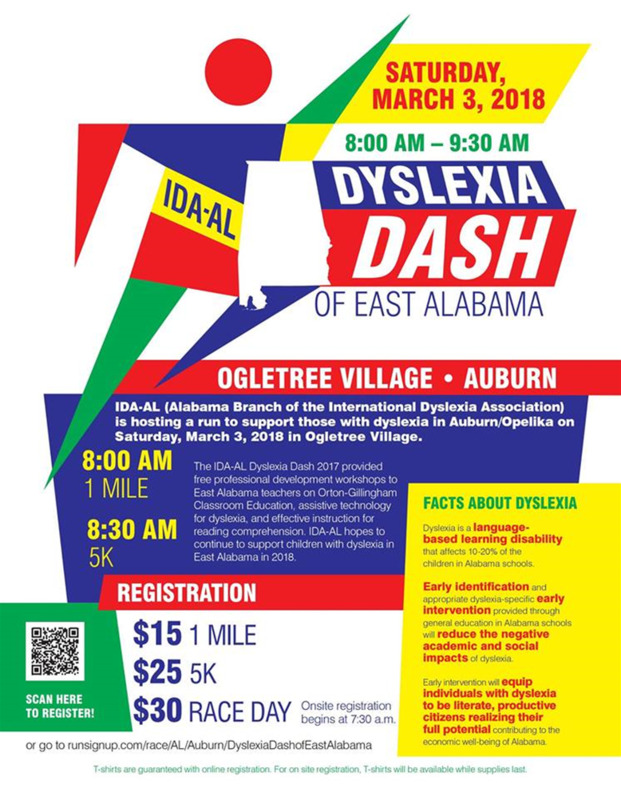 The Alabama Branch of the International Dyslexia Association (IDA-AL) will again use the funds from the Dyslexia Dash to help support those with dyslexia and dyslexic characteristic by promoting activities that involve dyslexia awareness, dyslexia resources, and professional development. Day-of race registration: $30 for each event (Fun Run and 5K Race). Please visit http://al.dyslexiaida.org for more information on the Alabama Branch of the International Dyslexia Association. This year, the fun run and 5k will be themed "A Whole New World” for children with dyslexia! Come dressed as your favorite storybook character. There will be carnival and storybook themed activities for kids. T-shirts are guaranteed with online registration until FEBRUARY 19. Extra t-shirts will be ordered, but sizes will not be guaranteed. Awards will be given to both male and female overall finishers and male and female age group first and second place finishers. Please click the document below to view age groups. Other awards may be given, and participants will also be able to receive door prizes.